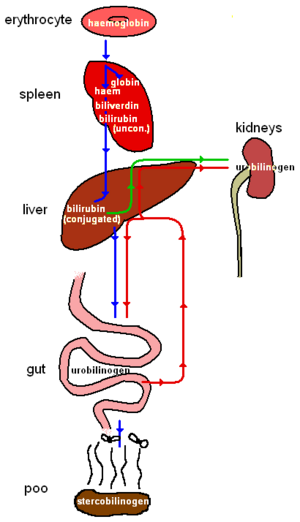 Urine - A small amount of conjugated bilirubin is absorbed straight from the liver. If the bile duct is blocked then a whole lot more goes into the urine, making it darker. A tiny amount of urobilinogen is absorbed from the gut. In early or recovering hepatitis, this results in pre-formed stercobilinogen appearing in the urine in excess as urobilinogen. Once the biliary obstruction is established this levels drops – so it is a sensitive marker of early liver damage. Confused? Me too. Enterohepatic Circulation - The urobilinogen is reabsorbed, and travels back through the liver and down the bile duct again. This returns the cholic acid and chenodeoxycholic acid to the liver, enhancing bile secretion. This page was last modified on 17 December 2009, at 15:26.